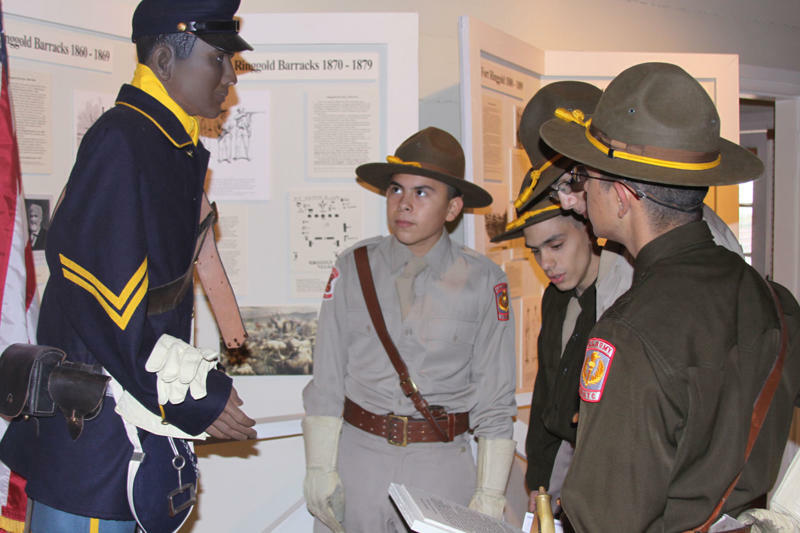 The Rio Grande City High School JROTC had the opportunity to explore the historical roots of Fort Ringgold and the Robert E. Lee Museum. The cadets were amazed with the amount of history the Lee Museum had on display and the many things they learned on that day. “I learned that our program is very similar to the soldiers that once were stationed at Fort Ringgold……we have similar uniforms and we have the same format,” said Cadet Major Stacy Muñoz. The Robert E. Lee Museum has been in existence since for a few years now and has provided much history on Fort Ringgold and the soldiers stationed there in the 1800’s. Several artifacts are currently on display in which were discovered during the renovation of the building. The JROTC program is a student led and student run program for the purpose of developing leadership, communication and presentation skills. The program has been extremely successful throughout the years due to its Honor Unit with Distinction status. This recognition can be obtained every two years and cadets work diligently in preparation for the opportunity to demonstrate their skills. Retired Army officials assigned to Fort Sam Houston conduct the inspection of all the programs throughout the state. Cadets are inspired by the program in which allows them to gain much knowledge and skills from participating in JRTOC. “I have learned to be more responsible and to treat others with respect. I have also gained organizational skills which will help me in situations now and in the future,” said Cadet Sergeant First Class Prisma Hinojosa. According to Cadet Command Sergeant Major Rosalinda Lara, she too has gained much from the program. She credits JROTC for helping her become more organized by having everything in folders and in order. She states that being organized is a must and it is an expectation not an option. Many cadets join the program as incoming freshmen and participate the four years of high school. According to Master Sergeant Marco Peña, the one part of the job that he enjoys the most as an instructor is the growth that occurs in the cadets from freshmen to senior year. The development that occurs and the ideas these students bring is what amazes and inspires the instructors every year. “When I joined JROTC I became more task oriented and I take pride in whatever I do,” said Cadet Master Sergeant Rosenaldo Garcia. It is clear that the Rio Grande City High School JROTC is an exceptional organization in which allows students to grow and acquire skills that will be helpful to them now as well as in the future. For more information on this program contact the JROTC Instructors, Major David Rutledge or Master Sergeant Marco Peña at (956) 488-6000.